Scripps: Antarctic Ice Shelf Collapse Possibly Triggered by Ocean Waves | Watts Up With That? Watch the Wilkins ice shelf collapse in time lapse animation – looks like ‘current’ events to me where mechanisms other than melt were discussed. It was pointed out that this photo appeared to be showing a stress crack, like the sort you’d get from a wave. Melt makes rounded irregular edges, not sharp straight line ones. Now there’s a study from Scripps that suggests that long period waves could be a big factor. Depicting a cause-and-effect scenario that spans thousands of miles, a scientist at Scripps Institution of Oceanography at UC San Diego and his collaborators discovered that ocean waves originating along the Pacific coasts of North and South America impact Antarctic ice shelves and could play a role in their catastrophic collapse. Peter Bromirski of Scripps Oceanography is the lead scientist in a new study published in the journal Geophysical Research Letters that describes how storms over the North Pacific Ocean may be transferring enough wave energy to destabilize Antarctic ice shelves. The California Department of Boating and Waterways and the National Science Foundation supported the study. According to Bromirski, storm-driven ocean swells travel across the Pacific Ocean and break along the coastlines of North and South America, where they are transformed into very long-period ocean waves called “infragravity waves” that travel vast distances to Antarctica. Bromirski, along with coauthors Olga Sergienko of Princeton University and Douglas MacAyeal of the University of Chicago, propose that the southbound travelling infragravity waves “may be a key mechanical agent that contributes to the production and/or expansion of the pre-existing crevasse fields on ice shelves,” and that the infragravity waves also may provide the trigger necessary to initiate the collapse process. The researchers used seismic data collected on the Ross Ice Shelf to identify signals generated by infragravity waves that originated along the Northern California and British Columbia coasts, and modeled how much stress an ice shelf suffers in response to infragravity wave impacts. Bromirski said only recently has technology advanced to allow scientists to deploy seismometers for the extended periods on the ice shelf needed to capture such signals. The study found that each of the Wilkins Ice Shelf breakup events in 2008 coincided with the estimated arrival of infragravity waves. The authors note that such waves could affect ice shelf stability by opening crevasses, reducing ice integrity through fracturing and initiating a collapse. “(Infragravity waves) may produce ice-shelf fractures that enable abrupt disintegration of ice shelves that are also affected by strong surface melting,” the authors note in the paper. Whether increased infragravity wave frequency and energy induced by heightened storm intensity associated with climate change ultimately contribute to or trigger ice shelf collapse is an open question at this point, said Bromirski. More data from Antarctica are needed to make such a connection, he said. In separate research published last year, Bromirski and Peter Gerstoft of Scripps Oceanography showed that infragravity waves along the West Coast also generate a curious “hum”-subsonic noise too low for humans to hear (see Scripps explorations story Earth Sounds from Central America). February 13, 2010 in Antarctic, Sea ice. ← 49 states with snow, 1180 new snowfall records set in the USA this past week – is February Headed For Record Snowfall? “(Infragravity waves) may produce ice-shelf fractures that enable abrupt disintegration of ice shelves that are also affected by strong surface melting,” the authors note in the paper. Disintegration of ice sheets already subject to strong surface melting. Possibly linked to increased storm intensity. I’m no lettered expert but logic told me, and I tell the warmist sheeple, that warming is drip drip…..crack is likely tidal action of some sort or tectonic activety. I lampoon that icebergs are a sign of growing glaciers/ice-shelves—the tidal action thingy. Retreating glaciers are not tide-water but up on the beach—-produce no icebergs or bergy bits. All those pictures of ice-choked Disco Bay are just ignorant propaganda. It should come as no surprise that India called BS to the IPCC shrinking glaciers…..especially the Siachen glacier—a 60 year old, on going, battlefield. The only reason the ice shelf was out that far, is due to all the ice behind it pushing it. the time to “worry” is when there are no ice shelves. They are just calving glaciers, aren’t they? Articles like this serve to highlight the real tragedy of AGW: so much interesting science was suppressed or obscured because it didn’t support the AGW hysteria. Is a long wave not a global warming effect ? OT – Phil Jones throws AGW under a truck! WUWT explained that the breakup was mechanical (i.e. not due to melting) nearly a year ago. Good to see others starting to catch up. Romm says extreme and catastrophic warming event. Obviously when the sea levels rise 6-15 feet, we will see a lot of this. Not in the case of the Wilkins. Oh, so it wasn’t global warming. Imagine that. Hmm, maybe he’s going to have to edit his power point and take out the snow cover bullet point. What? AGW makes bigger waves now? The surfers will be happy. The sea water in the open fissures seems to be refreezing at a nice clip, no melt water on the iceflows, doesn’t seem to be ideal conditions for “strong surface melting”. “Possibly linked to increased storm intensity.” It’s more like possibly linked to possibly increased storm intensity possibly linked to possible climate change possibly linked to human activity. Or maybe it’s just a bunch of Martians jumping on pogosticks. lots of “possibly”, “could”, “may” and the usual stuff from this blog. I have often wondered what the effect of the Dec 2004 tsunami had on the ice shelves. looks like a calve to me from this link ?? Confirmation bias is so interesting. When anti-AGW believers don’t see papers they like, it’s evidence of censorship. When they do, it’s evidence that censorship is breaking down and failing. As opposed to, say, considering the possibility they may have been wrong about alleging censorship in the first place. I would be worred if that ice shelf drifted out into the shipping lanes. The way they cavalierly run cruise ships about these days, it would be an accident looking for a place to happen. Oh, but the surfers are in wave heaven. Lots of tectonic shaking going on with that Solar Activity (AP) thing way down (whatever it might have to do with it). I wonder if Bromirksi has an office anywhere near true believer, Somerville? That would make for some awkward hallway encounters. Where do you see “censorship”? you are correct, i think, no glaciers here. anthony, you need a “NEVER MIND” button for idiots like me. Why are anti-AGW believers seeing papers they like now? Is it because Jones is not sitting in his ‘chair” now, or is it because others are concerned about the possibility they might be removed from their own ‘chair’ if the shenanigans continue? Maybe it is just a coincidence. I dunno. Robert you would explain then why every paper ever reported on before Copenhagen was alarmist? As for non-believer, it ain’t a faith Bob. It’s science. I wasn’t able to open the BBC link but this was up on NewsBusters.org, Phil Jones and the BBC. By what measure was the breaking off of part of the shelf a “catastrophe”. Is there a list somewhere of the damages caused? “Carbon dioxide is “essentially harmless” to human beings and good for plants. So now will you stop worrying about global warming? Utah’s House of Representatives apparently has at least. Officially the most Republican state in America, its political masters have adopted a resolution condemning “climate alarmists”, and disputing any scientific basis for global warming. Now, just because the world stopped warming 10 years ago and has been cooling the last 2 years rapidly doesn’t mean that we all have confirmation bias. Nobody is saying that since the world is cooling rapidly that we will now enter an Ice Age faster than previously imagined (quick, pass AGC legislation and tax/ban the crud out of refrigerants). Hansen, Schneider and others already blew that trumpet in the 70’s, and look what happened. Nobody is screaming that the Sea Level will drop catastrophically and high-center the ports of the world. Nobody is shouting the dire consequences of glaciers running down the Mississippi and the Nile, or running frantically down the street with “The world will end with NY buried under a mile of ice. What we are saying is that AGW isn’t happening, and the world’s weather is confirming it week after week, month after month, year after year. That’s not bias, that’s what’s for dinner. I’m curious: has anyone measured the elevation of the separated portions of the ice sheet and compared it with the intact portion? If there is no difference, then the wave theory is persuasive. If it’s lower, then what: lower sea level? If it’s higher, then maybe there’s some rise in sea level. The measurement shouldn’t be a problem. I actually thought about this possibility when I read the article on the ice breaking off but then shrugged it off as not possible. Whilst reading the article, I was wondering when the de riguer AGW reference would come. I was not disappointed. Surely it must now rank up there with “do not try this at home – this …..(study) is performed by highly trained …. (prp scientists)”. In my simple world of civil engineering, ice would be up there with “brittle” materials like concrete that crack due to low tensile strength. Throw in some cyclic loading and we have fatigue failure. So where is the cause of the tensile stress? Well, we do have that (possibly AGW enhanced) wave action. Complicate it with buoyancy effects due to ice thickness, daily tidal effects, freeze thaw cycles (change in loading), grounding, wind loading and a temperature difference between the sea below to air above. Throw in some glacier action causing lateral loading and I see a very complicated dynamic system. Is it “new” ice, old ice, (rotten ice ;))? Are there residual flaws or fault lines in the ice shelf from some geophysical effect? Call me a skeptic but I just don’t see this event as some kind of “Big Wednesday” of infragravity waves. This alarming title is begging for an illustration of the propagation of these long period ‘infragravity waves. Without this it is difficult to discuss in any detail how these waves arrive at the break-up site and produce such fractures. Where I live – In Western Australia – we see a lot of these infra-gravity waves going past. But in the opposite direction, from Antarctica Northwards. We have very large swell here that can exceed 10 metres (30 feet) at some locations off the coast. I know because it was my job to measure it with directional wave buoys for a number of years. The source of these waves are the very deep depressions circling the Antarctic continent. I would have thought that these massive wave generators near to Antarctica would have a much greater effect on the Antarctic shoreline than generators half way around the world. Good stuff. We’ve been in Antartica permenantly since the 50s? And satellite coverage since the 70’s? Part of the problem here, as in much else about climatology, is the hubris of jumping to the conclusion that just because its the first time *we’ve been there to see it*, it must be new. Otoh, to say that these infragravity waves could very well be the trigger, says nothing about what makes ice shelves vulnerable to these triggers in the first place. Could be a natural aging process. . . could be due to thinning of the shelf due to global warming. I don’t see any particular reason to favor one theory over the other right now. Please. The proper term is “skeptics.” Scientific skeptics, if you prefer. As in, skeptical of the unproven CAGW conjecture. Thanx. If it’s proof you want, just listen to what people are griping about. They’re mostly griping about the cold. Why miss out on one of life greatest pleasures? If it’s not cold enough for you, move to where it is, then you can enjoy griping about how cold it is. You don’t hear Gore griping about how hot it is. He’s too busy buying up beachfront properties while scaring everyone else into selling. Better yet, if you are still convinced that AGW is the way to go, ask your Real Estate Broker if the Yukon is right for you. Get it while it’s hot. Who would have thought that long period ocean waves could fracture ice shelves? Of course the authors have to genuflect to the AGW consensus with the gratuitous “ice shelves that are also affected by strong surface melting”. “[Infragravity waves] may produce ice-shelf fractures that enable abrupt disintegration of ice shelves that are also affected by strong surface melting,” the authors note in the paper. “Surface melting” my foot. Those icebergs in the top image are 600 feet thick. Any “surface” melting is occurring 70 feet above sea level, and doing so despite the temperatures so low that the salt water is freezing down on the sea surface. Not likely. In the Wilkins breakup animation, note that the time between when we first see the green highlighted ice, through it’s compression of the shelf, to its final departure out to sea, is Two Weeks. That is one heavy swell, very “infra” indeed. It isn’t hard to imagine how much the sea level steadily rose during those weeks, and how much stress that put on the 600 ft thick, brittle ice shelf floating on it. It would be interesting to see the Jason sea level data for that area, if it’s available. Surprised there wasn’t a mention of tsumanis and their added stress. They involve the whole column of water. Even small ones would do some damage, or weakening. That Sumatra quake created a pretty nasty one a few years ago. Even that Samoa one recently had to have some effect on those ice shelves. Didn’t WUWT have something about cracks and Ice shelves a while back? Something about tidal influences and waves…. Can’t remember now. Looks like us unruly mob are way ahead of them… But it is good to see it scientifically confirmed in a new paper. 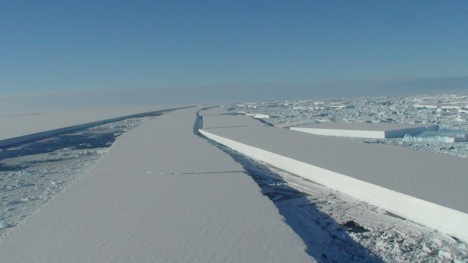 For more information regarding the Wilkins Ice Shelf break up I posted an article on this subject last July at http://webdiary.com.au/cms/?q=node/2971, which covers some of the issues raised in this blog and elsewhere. Robert — Confirmation bias is so interesting. When anti-AGW believers don’t see papers they like, it’s evidence of censorship. When they do, it’s evidence that censorship is breaking down and failing. Essentially what you’re seeing the skeptics happy about is that there seems to be a growing movement toward some rationality. As the AGW crowd would have it, “climate change” means that there are warmer winters with less snow. Or there are cooler winters with lots of snow. Essentially, what they’re claiming belongs more in the realm of a belief system. If it’s not falsifiable, it’s not a real hypothesis, much less a theory. A theory, meanwhile, makes predictions. If the theory is that we’re going to have warmer snow free winters in the US, having the opposite happens falsifies the prediction. If the prediction is to have colder snowier winters, a warmer, snow free winter falsifies the prediction. Saying “we’ll have warmer winters except when we don’t” is simply nonsense. It’s certainly not science, and any child could make this same prediction. As a result sketpics see papers that seek to attribute falsifiable theory to physical phenomenae and cheer accordingly. Ice shelves break because of warming (how? We’re not sure, we’ll get back to you) except when they don’t isn’t falsifiable. Attribution of ice shelf breakage due to the action of oceanic wave systems IS falsifiable. If you can’t falsify it, it ain’t a theory. It’s painfully simple. Nice takedown, Ian. Even without any special knowledge of ice shelves, my first question would be and was, “why wouldn’t an ice shelf fracture?” Why would anyone presume they go for very long periods without breaking? I would have thought continued belief in CO2 AGW doctrine a much better and more interesting example of “confirmation bias”, especially the delusional kind where it is instead alleged that the non-delusional have a bias. The trolls are awake again. Sorta like how many DECADES we’ve been waiting for the empirical evidence that CO2 is driving “climate change” or whatever you are calling it these days. And don’t try pointing at a study based upon a model. That ain’t empirical. An interesting comment from Jerry [18;19;15 ]from Western Australia on the amplitude of the Antarctic origin depression caused swells that head north up past Western Australia. Which raises the unanswered question in this article on “Infragravity” waves. What is the crest to crest distance and the amplitude of these “Infragravity” waves? Short crest to crest distances in Antarctic depression origin waves as “jerry” describes, would only affect ice shelves for a very small distance into their interiors and probably don’t have enough energy in each individual wave system to seriously affect the structural integrity of the ice-shelf. Very long “Infragravity” wave crest to crest distances of tens or even hundreds of kilometres would have the capabilities to lift an ice-shelf some metres for many tens of kilometres into it’s interior with the consequent immense stress deep into the interior of the iceshelf and the formation of stress cracks and the eventual calving of massive bergs from the shelves. That crest to crest distance and the amplitude of the claimed “infragravity” waves is the key to any substance in this claim and neither the abstract nor the press release reveals this data. Nah, that can’t be right can it ? I mean you have the whole southern ocean going all the way round Antarctica, and sloshing back and forth through the gap between the tip of South America, and the Antarctic Peninsula twice a day. Do those Scripps chaps really think that could cause waves to go driving under those ice sheets, and , like lift them up a bit and buckle them. That sounds a bit far fetched if you ask me. I mean we kicked this crazy idea around a couple of years ago when the whole bloody thing collapsed; but, well we were just joshing weren’t we; what the hell do we know about waves going under ice shelves. I certainly don’t have any degree in Oceanogrraphy from Scripps or one of those fancy places; so it would be like just a wild arse guess on my part to think about the Atlantic, and the Pacific, running back and forth through that gap, and driving all that water under those shelves, on the Antarctic Peninsula. Well now the real scientists have kicked into gear, and they apparently seem to think that ther may be something to our cazy ideas. Maybe we aren’t as stupid as we think we are Anthony. So, stress cracks the ice sheets. Just like……you know where I’m going with this. The distinction in waves is wind-wave, typically under 15 seconds (arbitrary cutoff) and what I called gravity waves with periods greater – typically 25-30 seconds, but obviously there is a spectrum and theoretically an infinite range of periods. However, the wave of interest that has the max ‘oomph’ is a tidal wave that travels at thousands of kilometres per hour, has amplitudes of up to several metres peak-to-peak and wavelengths again of thousands of kilometers. These waves typically hit most shorelines twice a day. Disaster around the world? No. I didn’t use the term tidal wave for nothing. These are just your regular tides. And yes, the wave crest speed is 40,000 km per 24 hours, roughly 1660 kmph or 1000 mph. I haven’t used the term infragravity waves before. In my day, they were just gravity waves. So getting back to these long period waves, in my experience they are of the order of under 30 seconds. In my neck of the woods, up to 10 metres peak-to-peak (sometimes larger). If they hit a beach or icefloe I expect they will be dissipated forthwith. Long period waves as you postulated would be competing with tides and I would bet tides would win every time. No doubt those waves are caused by GW. I looked up Wilkins ice-shelf tidal data, but google gave me a huge amount of global warming stories rather than any hard data. Instead I had to look at the Ross ice shelf which is further west but equally exposed to North Pacific gravity waves. Here is some tide and wave hard data. Thanks jerry. I’m just an old guy playing with ideas. Leaving out all the local influences, are there any consistent differences in the heights of tides between Antarctica and the Equator that are also consistent with the differences in latitude. ie; does the same tide around say the Antarctic continent and at the equator show significant differences in their height range and other characteristics? Probably a school boy question below as the answer is most likely to be given as, it’s the moon, stupid! Again leaving local effects out, do the tides lag somewhat at any latitude or do they pass through the same longitude at about the same time regardless of latitude? (18 meters) it was not possible to see the wave behind the wave in front of the yacht, wind of 130 km hour (normal ) and this has no effect on a ‘floating ‘ ice shelf ? All I can say is that tides vary all over the world. The principal drivers are called M2 S2 K1 and O1 (moon and sun and primary derivatives). The reaction to these forces is principally bathymetric. i.e. shallower water shows most response. You can have places of high latitude with large tides, e.g Bay of Fundy, but you can also have low tides – in some cases zero tides – check out amphidromic points, ( http://en.wikipedia.org/wiki/Amphidromic_point )one of which is in the ocean not so far from me (mid latitudes). So no. latitude is not particularly important. The tides on the Ross ice shelf are similar in magnitude to the North West Shelf of Australia – which is about a third to a half of the world northwards. They are both very much smaller than the Bay of Fundy, or even the north coast of Australia. Loos like quarried stone on a large scale. Granite after erosion has removed a multi-kilometer load of overlying rock expands causing sheet (subhoriizontal) fractuing,often freeiing up large (multi square kilometer) slabs a few to several meters thick. Because of hydration, tectonic forces and stresses caused by freeze-thaw cycles, result in orthogonal fracturing into smaller blocks. The resultant vertical fractures are guided by a preferred orientation of feldspar crystals (often only 5-10 percent) which themselves hav an orthogonal cleavage. I suspect that a petrgraphic study of the ice would reveal a preferred orientation of crystals or a cleavage that presents planes of weakness. Quarriabiliy of granite depends on this texture. It seems appropriate to say that their observations will one day prove beneficial in understanding why things happened the way they did; and that, at this time, it is too early to determine anything of any real significance from their data. by the trapping effect of mid-ocean ridge topographic waveguides. The longwaves could not negotiate the rapid change of direction of midocean ridge in the Indian Ocean, and headed straight south to the Antarctic. The offshore waveheight of the tsunami is only 0.20 meters according to a graphic in the article, but the shoreline wave height can be much larger depending on the shape of the ocean bottom locally. Its effect? Good question. I can’t believe others let you slide with that. Get the facts. There is no increased storm intensity. In fact it’s reduced. Find another AGW linkage to debunk. Ice shelf break up may be due to tidal forces but if so, we would see it more often. This post seems to suggest that it is an unusal event. What happens if an infragravity wave coincides with tidal force or even a tsunami wave coincides with tidal force? The only way this qualifies as a catastrophic collapse is if this has never happened in the past. Further to Robert, be prepared to see a steady flow of studies and documents all of which demonstrate that climate phenomena is due largely to natural variation – which includes a huge complex of inputs. Note the inset photo indicating what tiny part of the continent is involved. And the words of “scientist” appropriately named Ted Scambos. Scam indeed. To separate you from your representative government, your accumulated wealth, and dictate the terms on which you work and live. The size of the fraud far exceeds that of the fragile ice shelf. Yeah, you’re exactly right. All we have once again is: if something is remotely and vaguely possible, it’s actual, it’s scary, it’s an epidemic, and we must do something really stupid which will almost certainly bring about a real disaster, or else “we’re all gonna die”. Pardon, I had no intention to offend; I was merely quoting – Robert (16:06:46) so that he could be certain my retort was directed to him. Noodlehead, sorry for the misunderstanding on my part. My apologies. Thanks for the comment J Peden. Having looked at the photos in the past of the Ice >>Shelf cracks could be seen before the event .This indicated to me shock waves caused by a larghe lmass of ice colliding with the fixed ice .The whole situation of the Graham land peninsula leaves it very vulnerable to weather from theforties and the squeeze point between the Peninsula and Cape Horn .Changes in the latitude of the westerly winds also form a part of the picture . How can one make anything out of a combination of the winds,the garvity waves mentioned above the movements of large masses of ice ? 1. Obviously, it indicates a disagreement with the mainstream view, like “deniers” or “skeptics” or “contrarians” or “critics.” So it does the basic job. The full title should be the nicely alliterative “disaster deviationists,” implying that we disagree not with the global warming thesis, but only with the catastrophic / runaway /positive feedback hypothesis. As a word I like deviationists and also the implications you note, Rodger, but other possible connotations leave me feeling a shudder coming on.